SHARP BLADES with round tips offering precision cutting. We all know there is nothing more frustrating than a dull pair of scissor when you want a nice, clean cut. Problem Solved. REMOVE EAR AND NOSE HAIR with these usefull clippers; Perfect for maintaining a clean look around the neck and sideburns in between barber visits. Multi purpose; ideal for shaping false eyelashes and even decoupage! It is a great feeling to have the right type of scissor handy when you need them! CLASSIC DESIGN Provides Easy and Comfortable Use; You will love having the right grooming tool handy whenever a need arises! 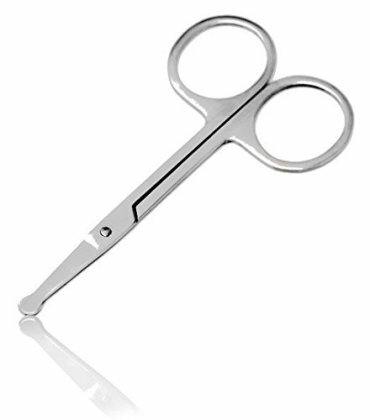 PRECISE, STURDY and ADJUSTABLE, with full blade contact, the surgical grade stainless steel resists rust and tarnish. Easily maintained by wiping with a soft, dry cloth and storing in closed position when not in use. An excellent value!